Below are my grandfather's keys. I never met him. He was born in the late 1800's and died in the 1930's. He was 50 years old when my father was born and died when my dad was three. I keep his key chain hanging under my fireplace mantel. That's where my parents kept it in their house so it's as good of a place as any. Let's call that a tradition. I love a good tradition. The interesting thing about this set of keys is that there is a little metal tag on them. I couldn't get a great picture of it where the writing was clear but it says "if you find these keys, please return them....and get a reward". Then, it gives the address to return them to along with my grandfather's last name "Leonard". Now, I don't know for sure but I'm guessing that one of these keys is a house key. By the way, the date on the tag is 1930. I guess homes were a little safer and people a little more trustworthy back then. Lastly, here are pictures of our puppies. They are a huge part of our family. Since we only have a son, we refer to them as "our girls." 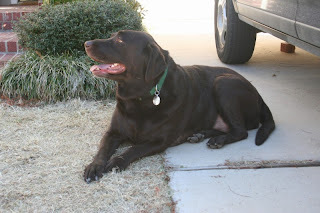 We got our first one, Ballou, in 2002 as my anniversary present to my husband. His dream dog had always been a chocolate lab. I snuck (is that a word?) a few bucks out each month for several months to save for her so he wouldn't notice a big hunk of money gone from our account. She is now 7 1/2 years old and the best behaved little lab in the world. Our other one is Bella. We got her for free (she was about 2 months old) when a family with very young children thought she was little too much to handle. She's an interesting little dog with a unique personality. She's now 4 years old. I love the keys! what a great symbol~ That's something I would do-I have my grandfather's empty can of pipe tobacco sitting on a shelf-love your braveness starting a new blog~ Keep it up! Wow....I love, love, LOVE the salt and peppers, and you have them displayed so wonderfully. The story of your grandfathers keys is great, how wonderful to have them. Thanks for posting and sharing your wonderful things. Have a great VTT! I like the display in the medicine cabinet. Love your salt and peppers and how you have them displayed. Keys are great too. 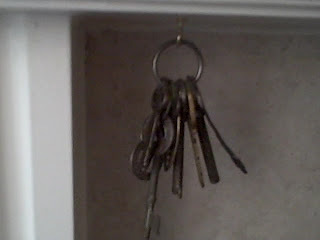 We have keys just like that, hanging on our kitchen cupboards. 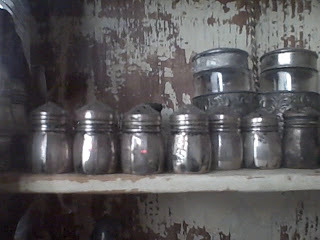 Love your shakers and I really LOVE YOUR CABINET!!!!!!! Thanks for sharing. And your dog is a cutie too. Cool stuff and sweet babies! 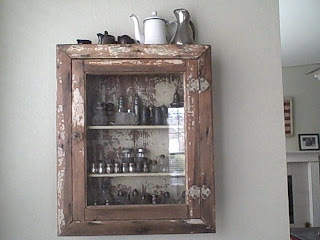 You old medicine cabinet is wonderful and a great way to display your salt and pepper shakers. I like the jar idea too. I love how you displayed your s&p collection! Your girls are adorable! Give them a big kiss from me! Ooh! 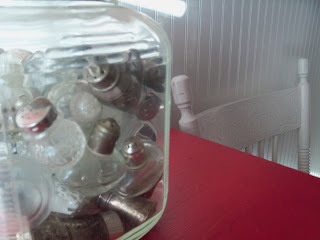 I love that you have a big ol jar full of something like salt & pepper shakers. That's a great way to display them. And your puppies are too cute! So many fun finds in your pictures! I love your family tradition with the keys! We also have a lab! Best dog a family could ask for :) Your girls are beautiful! 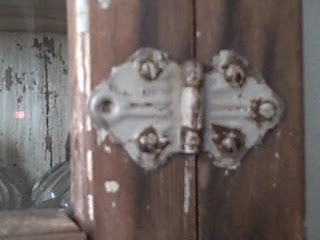 I love the cabinet you have to display - it's so perfectly worn! Beautiful. And adorable puppies! What a really cute display you have for your s&p shakers, love the way it looks on your wall! 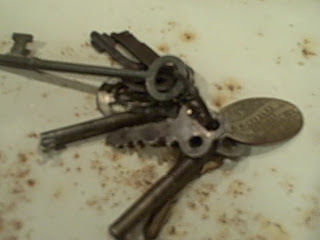 And I am a big fan of old keys too- I have been wanting to make a shadowbox display with my stash. How funny about the address being right on the keys, yes I guess it was a different world then, huh? 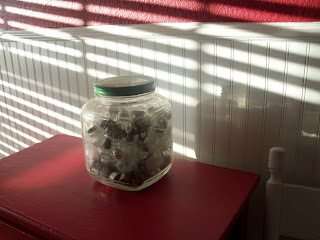 Great idea with the giant jar.I'd never have thought of that! 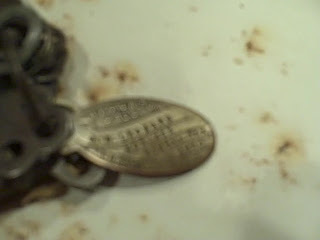 btw,I have my grandparents housekey,too:)How cool. I love the keys and where you hang them is awesome.